La La Land is Damien Chazelle’s third directorial effort and comes only a year after he wrote and directed my top movie of 2015, Whiplash. Again, we are treated to a musically charged affair, that is not only about the craft of music (along with budding film aspirations), but is a full-fledged old style musical itself. 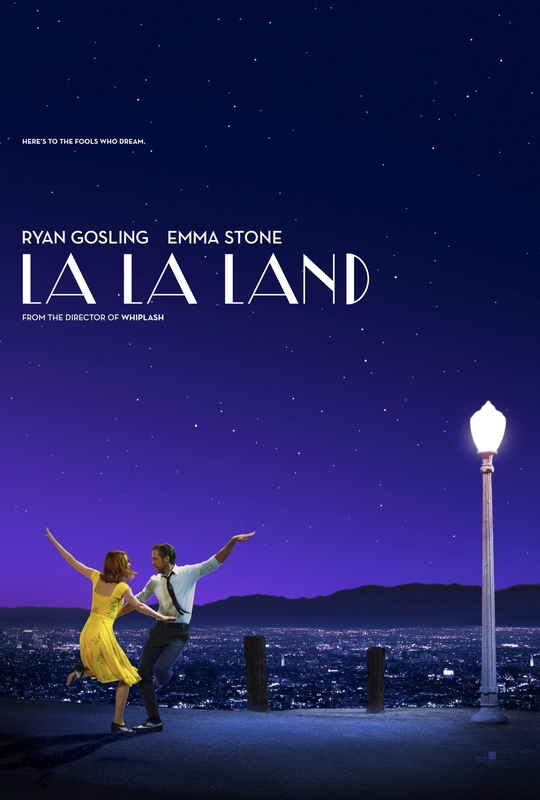 It is clear that Chazelle is tremendously talented, and with La La Land he has created another Oscar buzz-worthy gem. 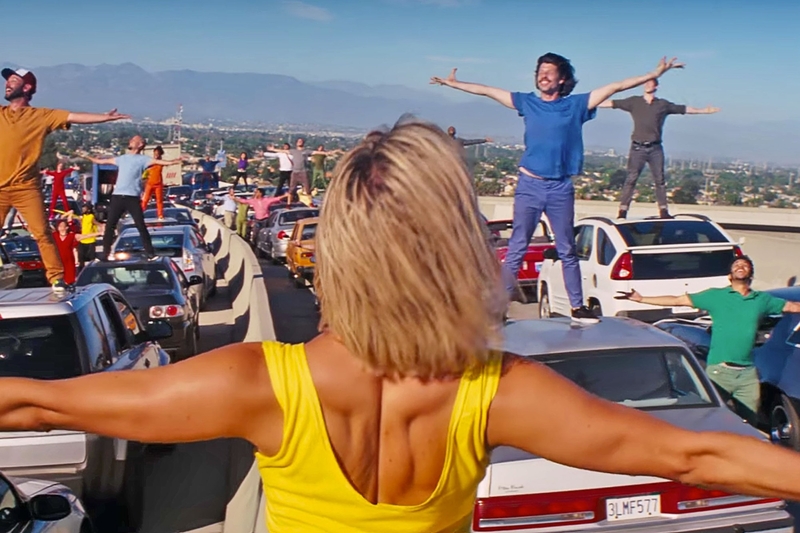 The movie opens with a large-scale music number originating from a traffic jam in ever-sunny Los Angeles. Immediately you know this is going to be a feel good upbeat affair. At the conclusion of the song, we meet Mia (Stone), an aspiring actress who works in a coffee shop on a movie studio property. Blocking traffic as she practices lines for a reading later that day, we meet Sebastian (Gosling) who is trapped behind her inattentive driving. The first encounter of would-be lovers is one of road rage and the extension of a bird for good measure. From here we follow Mia’s day, which progresses from bad to worse…spilling coffee on her white shirt prior to a casting call…futilely performing at said casting call…and being separated from friends who drag her out to a party…and finally getting her car towed with no friends and no cell service. On her walk home, she hears a piano playing, which entices her to walk into a small dinner club where Sebastian is in the process of ending his employment via song. At this moment, we flip back to the earlier car sequence and follow Sebastian’s day. 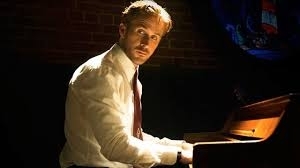 A talented jazz pianist, Sebastian fails to keep steady work. He is relegated to playing Christmas standards for barely noticing dinner patrons. He veers from the set list, just as Mia is walking by, setting up the second encounter. JK Simmons has a cameo here as the dinner club manager that gives Sebastian his walking papers for not playing the Christmas standards… and as usual, Simmons steals the scene. Seasons denote the 5 acts in La La Land, beginning and ending with winter, somewhat ironically, since LA lacks what most of us would call a winter. The third encounter begins the spring act as Mia runs into Gosling sporting full 80’s garb and playing synth at a pool party. Sparks begin to ignite and the pair learns of the others fledgling dreams. In this, they have opposite effects on one another. Overhearing a conversation between Mia and her mother, Sebastian decides to swallow his musical ambitions and join a trendy band. Mia, because of Sebastian’s encouragement, stops auditioning for parts and goes off to do a one-woman act. In the end, they may get what they want, but perhaps not the way they intended. The music of the movie perfectly fits with the story. Mia and Sebastian’s theme carries both the brightness and intensity they share with just a touch of bittersweet. Visually, perhaps the most striking and out of place item takes place in a planetarium. There Mia and Sebastian literally dance into the stars, though clearly, the entire sequence symbolizes the burgeoning relationship. 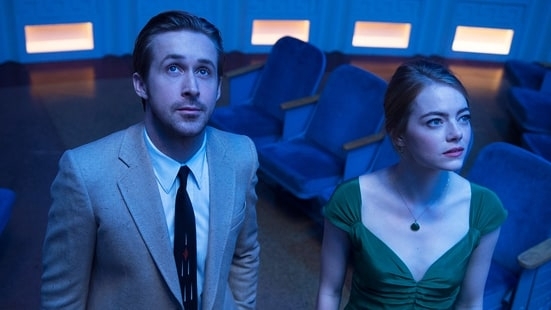 The narrative stays tightly on Gosling and Stone, whose shared chemistry, propel this movie forward to great effect. Chazelle has an even bigger winner on his hands this year, and deservedly so.